Pizza is such a wonderful thing isn’t it? There’s just so many options. I think you can “pizza” almost anything. 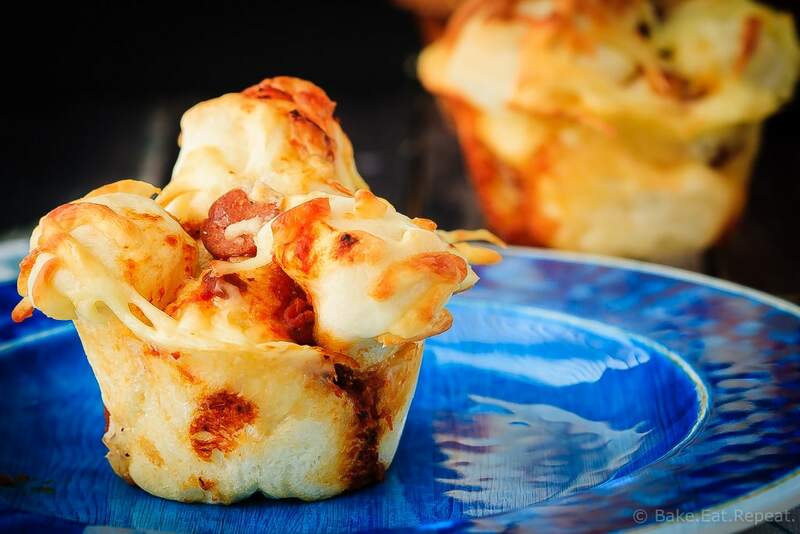 My latest favourite pizza option is these pull apart pizza muffins. 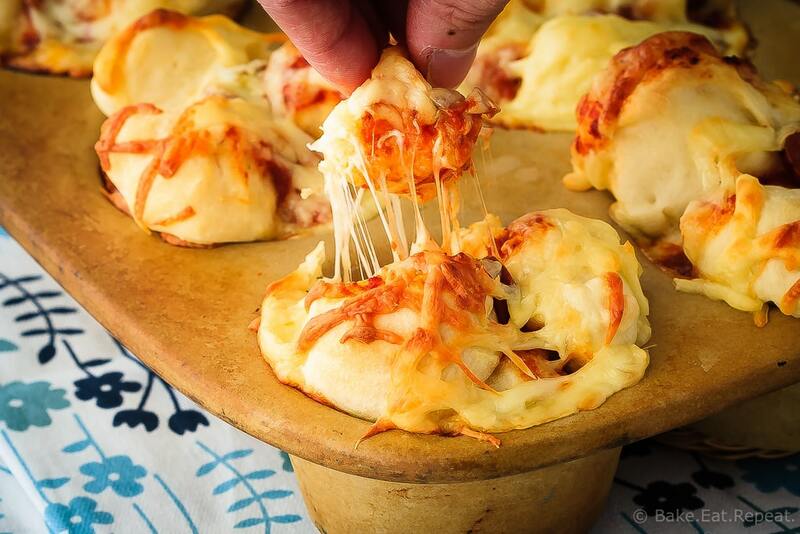 Pizza in cute little muffin form that pulls apart into bite-sized, cheesy, pizza pieces. I used this no-rise pizza dough for these pizza muffins and it was fantastic. The beauty of using this dough is that the muffins don’t really take all that long to make. The dough itself takes minutes to mix up, and assembling the pizza muffins doesn’t take a lot longer. I let them rise just long enough to puff up a bit (only ten minutes) and then you toss them in the oven. Pizza doesn’t get too much easier. Or a whole lot more fun! My kids got a real kick out of pulling the muffins apart into bite-sized pieces, each piece full of cheesy pizza flavour. Pull apart pizza muffins are really just plain fun. And the kids can even help make them – you don’t have to be real particular about the shaping or anything. Just cut up the dough into pieces and layer the pieces with pizza sauce, cheese and whatever toppings you like. Done. And, as usual, my favourite part (besides how easy they are) is that they freeze beautifully. Which makes for easy snacks or lunches or meals on-the-go. Having ready-made lunch stuff in the freezer just makes me happy. I love having something to throw in the kids’ lunches without having to actually make lunches. They love it too. Pizza for lunch is always a hit with my kids. The only problem is that we love these so much that I have to make a giant batch in order to have any left to freeze for lunches! At least they’re easy to make. 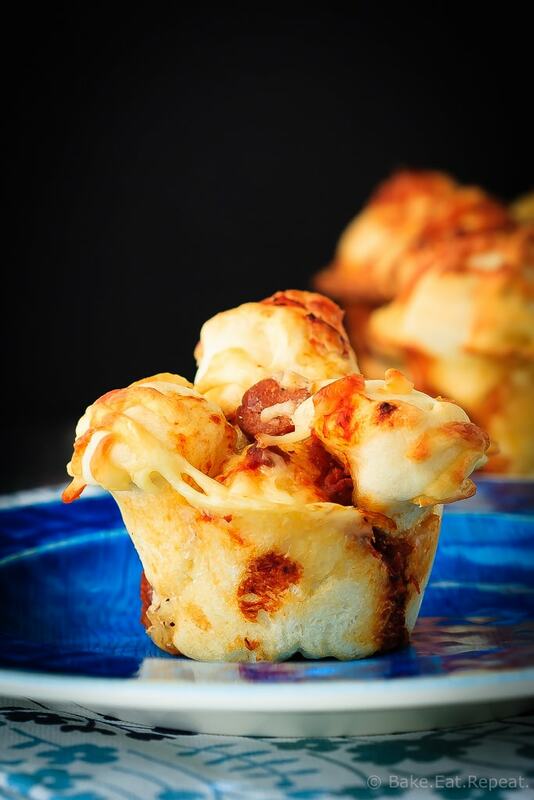 I’ve also shared this Pull Apart Pizza Muffins Recipe over on Food Fanatic. Has anyone tried this with pre-made pizza dough or pillsbury biscuits? I don't have the patience to make no-rise from scratch. I haven't tried it but I don't see why not! Let me know if you try it! Hi Darla - it says to put 3 balls of dough in the bottom of the muffin tin cups, put the ingredients on top, then repeat with another 3 balls of dough and more ingredients. So put the balls of dough, then the pizza toppings, then do 3 more balls of dough, then more pizza toppings. You're essentially layering the pizza dough and the pizza ingredients into the muffin tin cups. Hope that helps.